Riversong is also a center of information and contact for the RiVER Pedagogy, particularly for the Francophony. (RiVER: Rishi Valley Institute for Educational Resources). 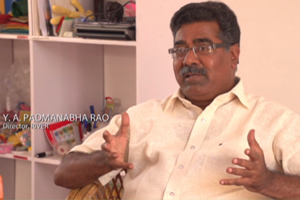 I met Mister Rao Padmadhaba and his wife Rama during a journey in South India, at the beginning of 2010. I had the opportunity to follow the basic training during a few days, to visit schools using the RiVER pedagogy (the satellite schools), to exchange with primary school teachers and people in charge of the training of the future teachers, as well as with academics coming from various European countries trying to understand the reasons of this success. My experience of more than 30 years in the new education quickly allowed me to seize the value of this pedagogy by seeing the pupils in class, devoted naturally to their learning in a friendly and joyful atmosphere. As in the saying “The pupil sits on the driver spot!”, the student moves forward according to his own motivation, his own capacities and his own rhythm. Every pupil ‘climbs’ a scale of learning looking like snakes and ladders. 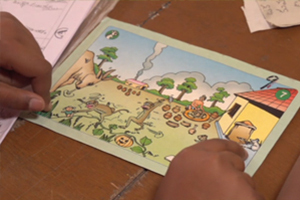 The child progresses freely by following indications given by drawings of animals, birds or insect, colors and figures. So, the child fetches his card, to make his exercise and, once it is learned, he takes the following card. Thus the child develops his autonomy and it is himself who has the vision of what is realized and of what remains to be learned. The primary school teacher is present especially around the first table, where the children need to understand the rules. Around three other tables are the older children moving forward individually, progressing in pairs or in a group. In these welcoming classes, decorated with care, the differences of age and level ended up being advantageous (MGML: Multiage, Multilevel). RiVER is specially designed for 4 primary years while the material of the preschool is in development. The children help themselves mutually. Furthermore, there are moments of the day for expression, which allow them to be understood, in front of a class and a primary school teacher with whom they create a relationship of trust. The philosopher J.Krishnamurti, who has himself initiated Rishi Valley School in the first half of the 20th century, abundantly developed how it is possible for the psyche to release itself from traumas of the past (and of any scoria). This knowledge is also used in RiVER method. The teacher, besides having the coach’s role, finds himself regularly close to every pupil instead of facing the class of a homogeneous group. Likewise, he is aware of the situation and specific needs of each child. Besides the diversity of cards and playful side of ‘the ladder of learning’, the theater (the Chinese puppets and the shade theater), the singing, the dance and the sports games are in many ways used for learning. The latter, is so natural that the ‘multi-sense’ carries remarkable fruits. UNICEF measured more than 30% of improvements regarding time and quality of learning. No child is neglected, the teachers do their work without being overwhelmed paying attention on every child. 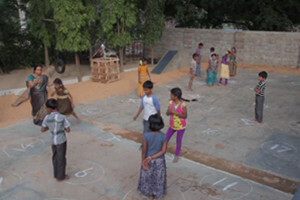 This functioning also allows the children of the rural regions to leave during the harvests and to return by resuming their scale of learning without losing the train of thought. Parents, community, city and country is involved: the integration is one of the keys of the success of this pedagogy. The fact is that, in 1993 there were 30 pupils, and in 2018, 20 million have benefited from this quality of education, this atmosphere of respect and confidence which is a very good start in life. There are thus 900,000 schools, and 320,000 teachers formed in RiVER method. 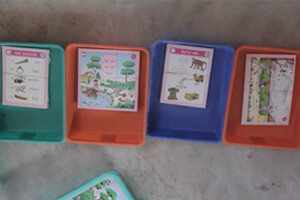 The little expensive school equipment, consisting of 600 printed paper cards, and a single teacher for several degrees offer a financial benefit. The cost of school fees by pupil, according to countries, is about CHF 20 per year. In Germany, RiVER is used with pupils of the regular classes, the classes of the upper secondary level, as well as for pupils diagnosed with Attention deficit hyperactivity disorder (ADHD). (See Thomas Müller’s book in the References). This educational method can be used in all countries, despite their language, confession or culture. In any case, it is not just a question of acquiring RiVER, but also this method will be totally melted in the language, culture and in imaging the country. It requires a fine collaboration, which allows the new partner to become a co-author and not a consumer. (See Nepal, Kenya and Ethiopia). To receive the link for the 20 minutes presentation film (shot in RiVER schools), please send us an e-mail with your full contact details. How to contact RiVER and what are the possibilities to introduce it in a region or a country? Information: Riversong center in the Romandy region in Switzerland (French-speaking). Training on a few days with visiting schools, RiVER Headquarters in India with a contact with the team of founders and teachers. tél. + 91 90008 68005.